There's a consistent exploration of orchestral light, translucence and patience (...). Plenty of evidence why this composer has long been considered 'one to watch' in Finland. 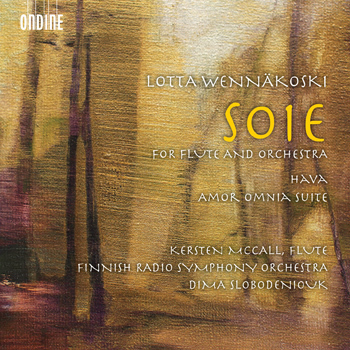 This new recording on Ondine includes new orchestral works by Lotta Wennäkoski (b. 1970). Wennäkoski's works are characterised by a rich and colourful sound world that often incorporates unconventional playing techniques and noise. In recent years her range of expression has become gradually broader, deeper and more powerful. Soie is a concertante work commissioned by the Finnish Radio Symphony Orchestra for flute and orchestra in three movements and placed on the list of recommended works at the UNESCO International Rostrum of Composers. The soloist of the work is Kersten McCall, the principal flutist of the Royal Concertgebouw Orchestra. Hava is an orchestral piece commissioned by the Tapiola Sinfonietta and premiered at the orchestra's 20th anniversary concert in January 2008. Amor Omnia is a silent film score of 90 minutes' length and Wennäkoski's most extensive work to date. In 2014, Wennäkoski adapted a concert suite from her film score, the Amor Omnia Suite. Wennäkoski is among the leading Finnish composers of her generation. Wennäkoski made her debut as a composer in 1999. Wennäkoski studied first violin, music theory and Hungarian folk music in the Béla Bartók Conservatory in Budapest and got her diploma from the Sibelius Academy in 2000. Her main composition teachers have been Eero Hämeenniemi, Kaija Saariaho and Paavo Heininen. In 1998-99 Wennäkoski studied in the Netherlands with Louis Andriessen. The recent recordings of the Finnish Radio Symphony Orchestra on Ondine have gathered excellent reviews in the international press. This album marks the debut of conductor Dima Slobodeniouk on Ondine. Slobodeniouk combines his native Russian roots with his years of musical studies in Finland, now his home for over two decades. Drawing together the powerful musical strengths of these countries places Slobodeniouk as one of today's younger generation of deeply informed and intelligent artistic leaders on the podium. In February 2013 Dima Slobodeniouk was appointed Music Director of the Orquesta Sinfónica de Galicia.